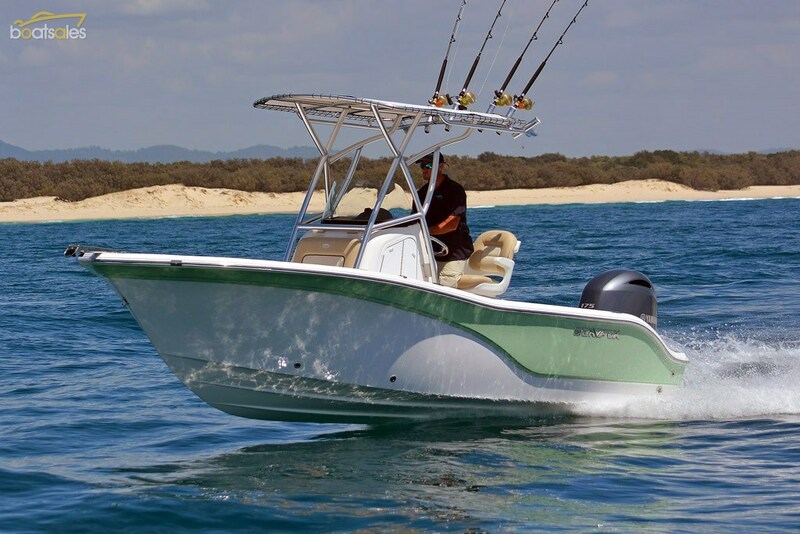 A feature-laden coastal sportfisher with frugal 175hp Yamaha four stroke outboard. 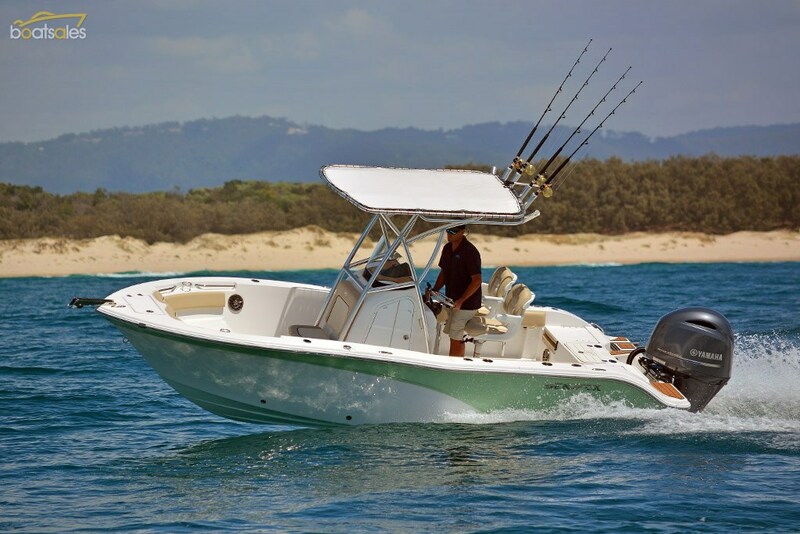 Sea Fox has expanded its centre console range with the new 206 Commander, a serious sports fisher and sports boat for coastal offshore fishing, day cruising and simply larking about on the bay or harbour. 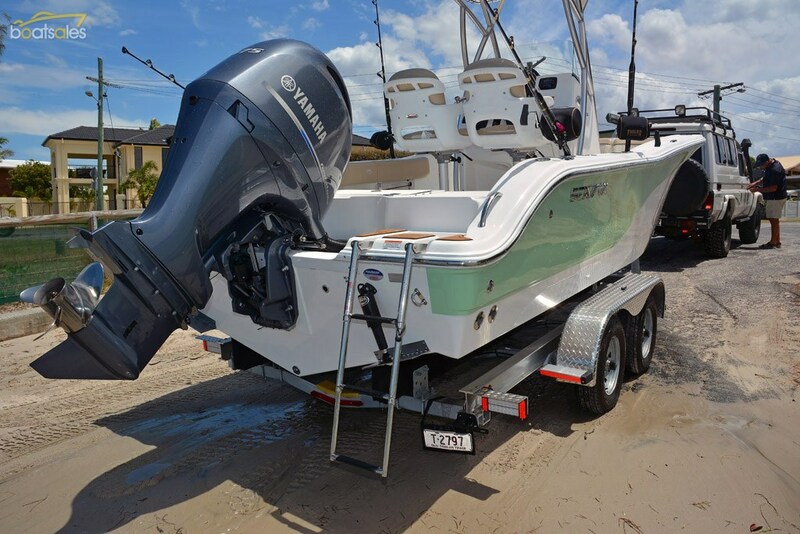 With a Yamaha 175hp four-stroke outboard on the transom, this compact, versatile new Sea Fox model also boasts excellent fuel economy. Based in South Carolina, Sea Fox boats has for many years specialised in the production of a range of mainly centre console boats from 5.0m through to about 10m in length. 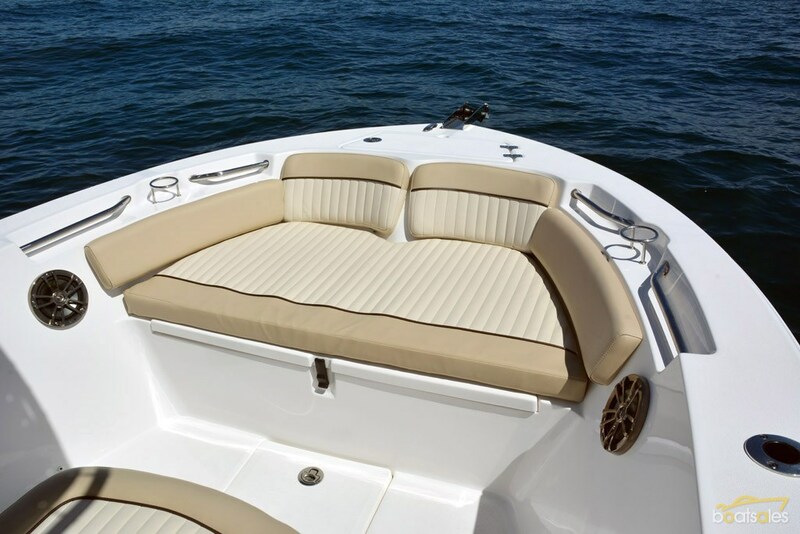 The boats are designed for offshore and bay fishing and boating and are built using an all composite (no timber) foam-cored fibreglass construction technique for enduring strength and durability. 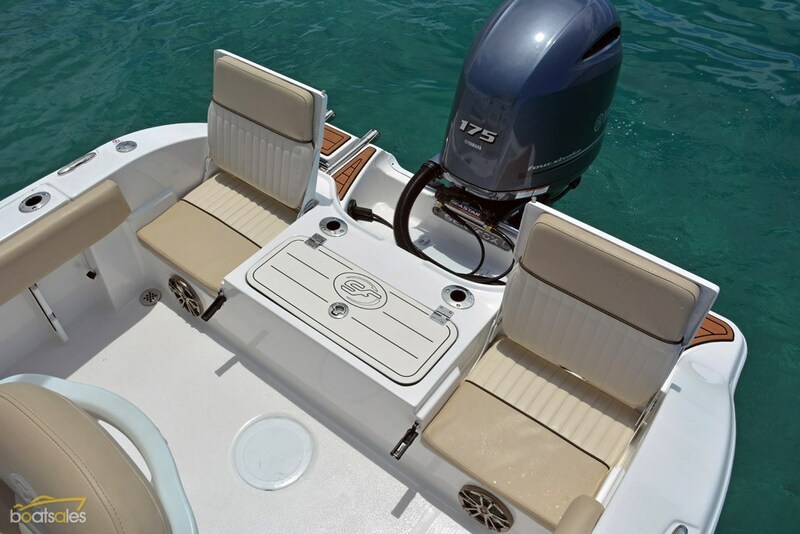 Sea Fox boats are also foam-filled to provide positive flotation and equipped with a fully moulded self-draining cockpit and dual 1100gph automatic bilge pumps for maximum safety at sea. There are now more than a dozen models in the Sea Fox range, and for this review we have secured the latest centre console model, the stunning new 206 Commander with the maximum power Yamaha 175hp four-stroke outboard engine. In addition to the smooth running four-cylinder, four-stroke extra-longshaft (25in) Yamaha 175hp outboard, our trick looking test package arrived on a tandem-axle Magic Tilt brand trailer built to Aussie specifications. 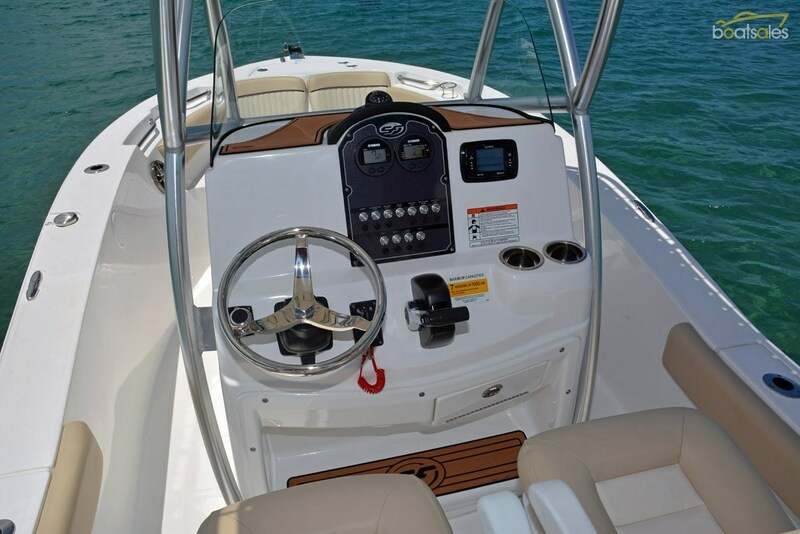 Like most Sea Fox models, the 206 Commander is loaded with standard gear. Key features include the bow casting deck with storage, sub-floor fish box (with bucket) at the bow, hydraulic steering with tilt-adjust steering wheel, anchor well with bow roller, 75 litre plumbed transom live bait tank, flip-up transom quarter jump seats, plenty of coaming cup holders and rod holders, boarding platforms with ladder, padded coaming bolsters aft with rod racks underneath, six pop-up cleats, compass, forward console cushioned seat/ice box (which can be converted into a second live well), raw-water deck wash, and a spacious head compartment under the console. Packaged with a slightly smaller, 150hp four-stroke Yamaha outboard (which should yield a 32 - 34 knot top speed), but sans trailer, the entry 206 Commander package is priced from $69,078 at JSW Powersports on the Gold Coast. Add the Magic Tilt trailer and the price rises to $75,898. The JSW Powersports team had rigged the test boat with a range of user-friendly options, most notably the aluminium T-Top with canvas cover and rocket-launcher rod rack. Other options included a cushion for the bow sun lounge/casting deck, Sea Glass green topsides coloured striping, faux teak deck at the transom, fresh water wash-down with 40 litre tank, Infinity stereo system with LED screen, MP3 adaptor and upgraded speakers, pre-rigging for dual batteries (shelved within the console), pedestal bucket chairs (instead of alloy framed bench lean seat), trim tabs, and the Sea Fox Pro Package – which includes a cushioned foot mat, gas shocks on one fish box lid and two extra gunwale rod holders at the bow. With the above options and with the larger 175hp Yamaha four-stroke outboard, the price as tested lifts to $93,329 with the trailer or $86,509 without the trailer. While $93k is a fair old sum for a 6.0m centre console, the Commander does have a lot of included gear and built-in safety features – including positive foam flotation, self-bailing decks, and construction to US NMMA and Coastguard certification. In addition, it's a lot better value than many other imported centre consoles of this length. 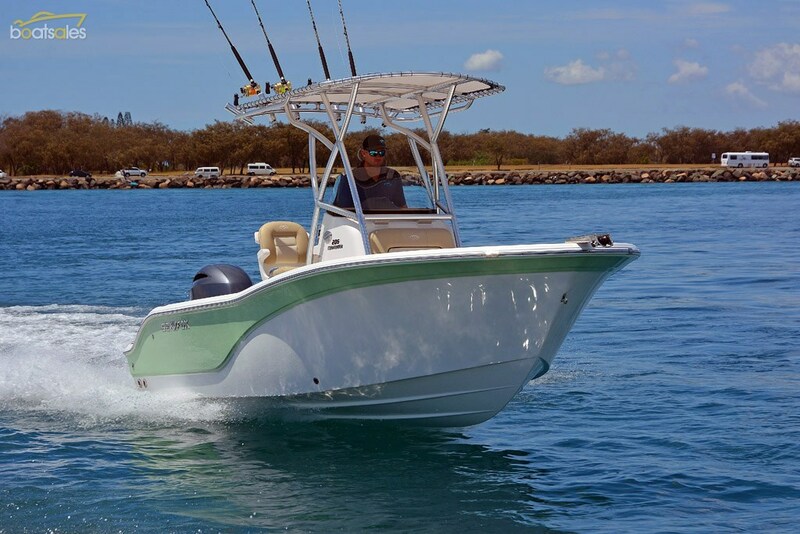 The 206 Commander is designed for serious bay/coastal and offshore fishing, but with a number of concessions to family boating, including the sun lounge with sculptured back-rests at the bow, the enclosed head compartment and the cleverly designed rear flip-up quarter or "jump seats" as they are called in the US. The seats are cushioned for comfort with hinged fibreglass back-rests. Flip the back-rests up and you have two comfy corner seats. Fold them down and you create a full width level casting deck as the back-rests sit parallel with the rear coaming. 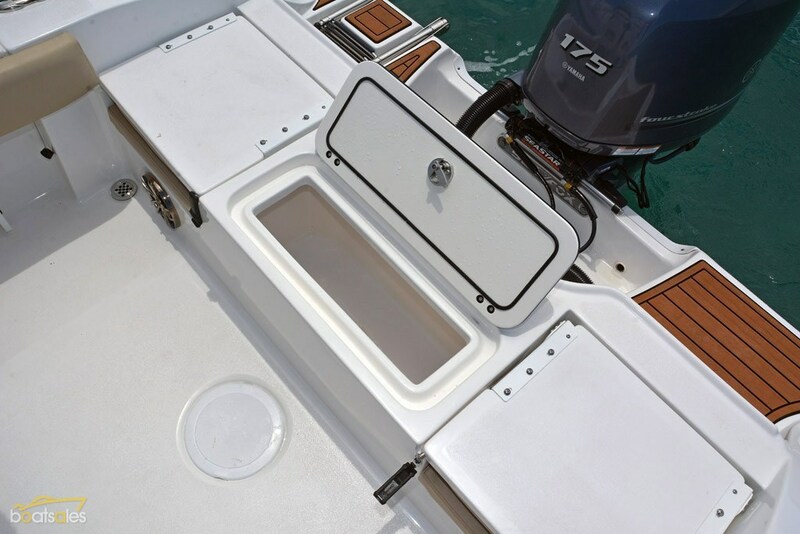 Folding the transom corner seats down also allows you to step through to the rear boarding platforms and the starboard side stainless steel boarding ladder. The platform created by folding the rear seats down is not large, but you could certainly stand there and chuck lures about when fishing sheltered waters. For offshore fishing, JSW Powersports has advised that they can fit a thigh-height railing across the rear of the platform so you can stand and fish while comfortably braced. We’d tick this option if we expected to fish offshore regularly. There is more freeboard along the sides of the 206 Commander, starting at around 480mm in the stern corners and rising to over 700mm further forward - as the depth and volume of the boat increases in line with the rising external sheer-line. Padded bolsters to the coamings aft of the console provide comfort and bracing in the stern, although there are no toe/footholds to speak of. Beneath the rear casting deck there is an oval shaped 75 litre plumbed live bait tank in the centre with storage areas under the flip-up jump seats. Other features include under-gunnel rod racks (two rods each side), six in-deck stainless steel rod holders (plus two optional rod holders forward), several drink holders and pop-up stern cleats. With regard to seating, the Commander can accommodate seven adults: two in the rear jump seats, two at the bow, two at the helm, and a single person on the moulded icebox/seat in front of the console. As noted, the pedestal bucket chairs in the test boat are options. The standard package comes with a two-person width lean-seat with back-rest, alloy frame and removable 45 litre icebox/cooler underneath. Both seating options work pretty well, although the test boat had been rigged with the dual pedestal chairs a tad too close to the console for complete comfort while standing at the helm. Otherwise the helm layout and position was excellent with all instruments clearly visible and the tilt-adjust steering wheel and binnacle throttle suitably placed. Overhead the canvas T-Top provides effective sun shelter, while the sturdy aluminum frame doubles as a grab rail for skipper and companion. In the fascia there is ample space for a flush-fitted electronics display (none-fitted to the test rig) along with standard instrumentation and switch panels. There are no cockpit side pockets in the Sea Commander but there is a large safety gear locker under the forward casting platform, glove box/key compartment at the helm, storage bins under the rear flip-up seats, and dry storage space in the console head compartment, which incidentally has standing headroom for 1.80m tall adults. The 206 Commander is a fine looking boat with a distinctive raised sheer-line at the bow, pronounced flare in the topsides, and a moderate 19 degree vee hull. This combines with its 2.4m wide beam and flattened chines to provide excellent balance and stability underway with a pretty comfortable ride in choppy water. The hull responds well to the included trim tabs and to adjustments to engine trim so you can set the boat up to run smoothly and safely in changeable conditions, to fine-tune the hull running angle for optimum performance. In a following sea, it runs flat, sure-footed, and punches easily out of wave troughs, while in blustery quartering seas the wide bow and flared topsides do a fine job of suppressing wind-blown spray. 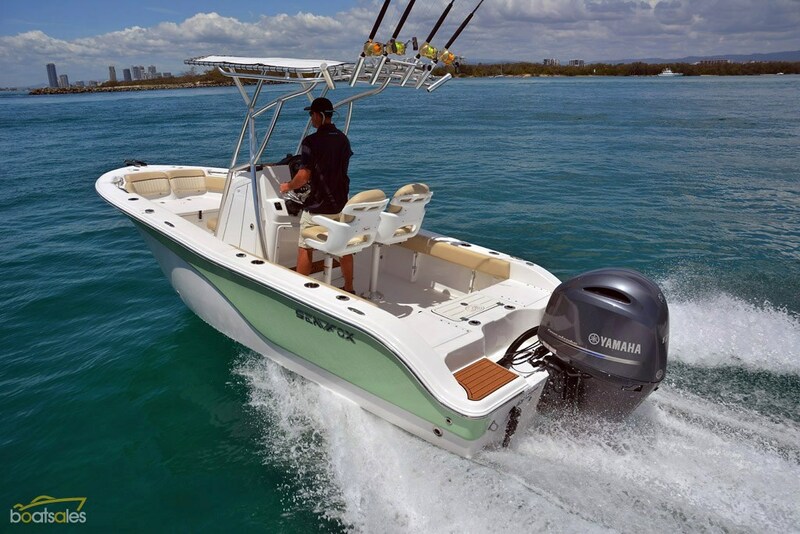 The 206 Commander is rated for a single extra-longshaft (25in) outboard engine to a maximum of 175hp, but will perform solidly with outboards in the 130-150hp range. Our test rig was fitted with Yamaha’s excellent F175 four-cylinder four-stroke and it proved swift and economical. We recorded a top speed of 38.2 knots at a wide open throttle of 5800 rpm. The boat/engine combination cruises beautifully anywhere between 3000-4000 rpm (at speeds of 17.7 – 25.8 knots) but is most economical at 3000 rpm, achieving a maximum range on the surprisingly large 264 litre fuel tank of 304.05 nautical miles. 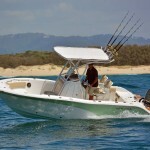 The 206 Commander is a great new addition to the Sea Fox range and an excellent boat in its own right. It is no more difficult to tow or manhandle at the boat ramp than the smaller 186 series model, but has a more seaworthy, offshore capable hull with more interior space and cockpit freeboard. 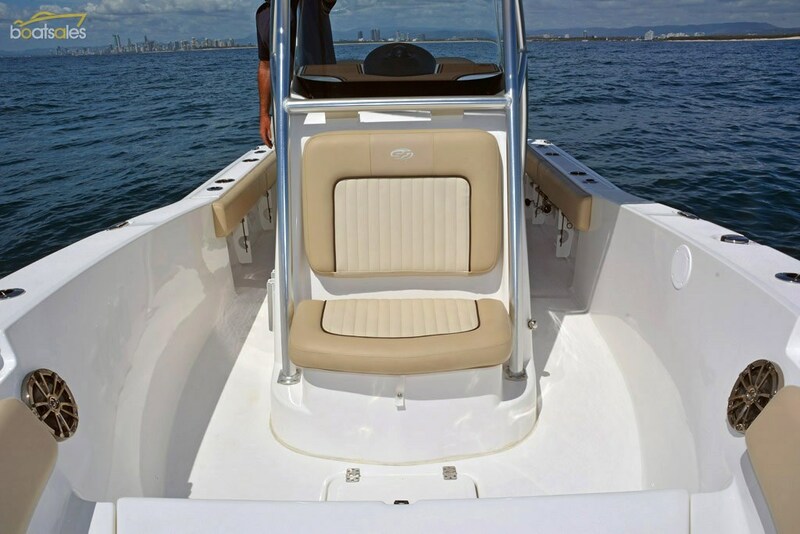 Serious anglers will value the fishing features (casting decks, live well, rocket launcher hardtop, in-deck rod holders) and seaworthiness of the 206 Commander, while family boaters will appreciate the spacious interior, deluxe seating, inherent safety features and sports boat level performance. Price as tested: $93,329 including Yamaha 175hp extra-longshaft (25in) four-stroke outboard, SeaStar tilt-hydraulic steering, tandem-axle Magic Tilt aluminium trailer (with mechanical brakes), coloured hull stripe (Sea Glass), faux-teak decking at transom, fresh waster wash-down, Infinity stereo with LED screen and MP3 adaptor with four upgraded speakers, pre-rigging for two batteries, T-Top with canvas, trim tabs, upgraded pedestal helm seats, pro-package featuring cushioned foot mat, gas shocks on one fish box and two extra bow gunwale rod holders, and boat and trailer registrations. Deduct $6820 if trailer is not required. Priced from: $75,898 including Yamaha 150hp extra-longshaft (25in) four-stroke outboard with hydraulic steering, tandem-axle Magic Tilt aluminium trailer (with mechanical brakes), and boat and trailer registrations. Deduct $6,820 if trailer is not required.